VMS Solutions attended Winter Simulation Conference 2017 (WSC). The Winter Simulation Conference (WSC) is the premier international forum for disseminating recent advances in the field of system simulation. In addition to a technical program of unsurpassed scope and quality, WSC provides the central meeting place for simulation practitioners, researchers, and vendors working in all disciplines in industry, service, government, military and academic sectors. Another successful year for VMS Solutions. 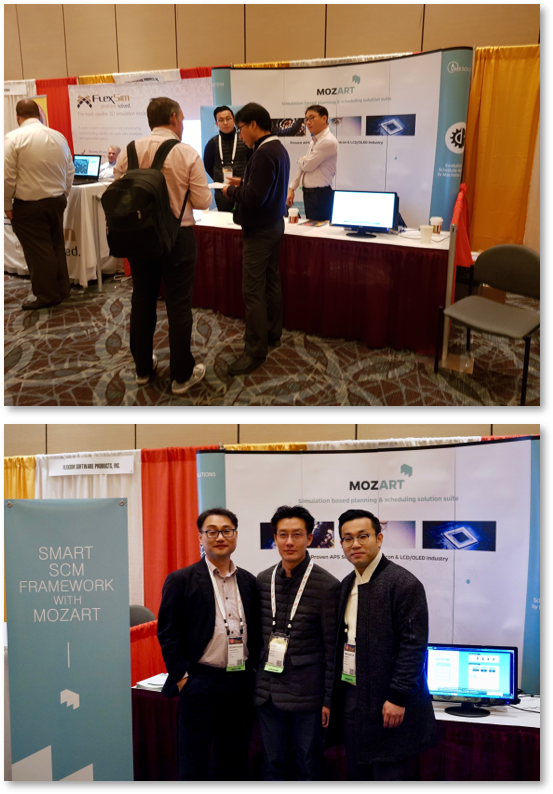 On this year’s four day event conference, VMS Solutions opened a booth to introduce MOZART, presented and demonstrated MOZART product through the Vender and MASM session. This presentation describes the VMS Solutions modeling system that is designed to simplify model building. MOZART provides specialized pre-built libraries according to manufacturing industries and application. Its configuration tool helps users construct their own system by choosing models, features and rules to meet their needs with great ease. As requirements for accuracy have increased, certain layers are required to be processed through the same tool. This could cause entities to be produced from a practical tool only resulting work overload. In the worst case, if that particular machine goes down, the entire product processing is suspended which causes critical cost losses. There are various ways to solve scheduling issue related to Photolithography Dedication. When it comes to practical use, there are various and numerous factors and events to be considered to apply the solution which is complex and time consuming. Through this demonstration, VMS Solutions presented how easily the solution for scheduling issue can be applied regardless to the condition and environment of the manufacturing industries when MOZART is used.